The Nautilus Project has thrown down anchor on the top fl oor of the behemoth ION Orchard. Coming from the same team responsible for the well-regarded Prime Society in Dempsey Hill, I had high hopes for a great meal at this new seafood restaurant. However, after dining twice at TNP, I’m not sure if ‘restaurant’ is even the word I would use to describe this place. A polished cafeteria is probably more apt – which is a shame, as the food is superior to the souped-up slop you’ll fi nd dished out in similar settings. A perfect example of this prioritising of style over substance is its choice of crockery. For my starter, I ordered the signature lobster trilogy. 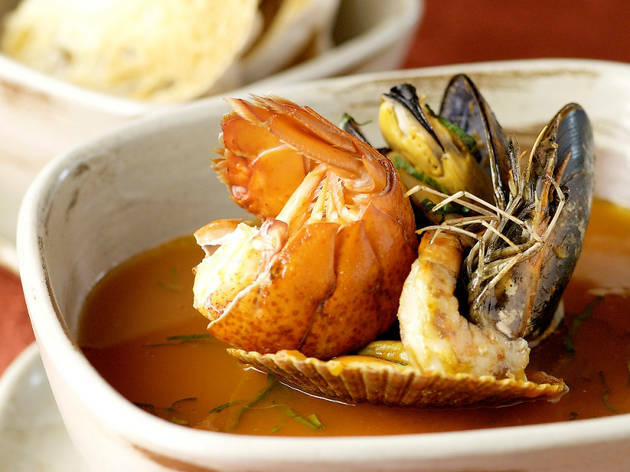 The trio of a chilled lobster salad, a caramelised lobster custard and a warm lobster souffl é is served in an impractical rectangular platter with three tiny bowls and impossible to eat with the knife and fork they provide. I looked like the Giant from Jack and the Beanstalk attempting to eat a meal out of Jack’s tiny bowl with a shovel. Using the cutlery resulted in the souffl é oozing all over the platter, followed quickly by the pâté-like custard (which incidentally would have been much tastier with some crackers). Before tackling my poor lobster salad, a waiter hurriedly ran over with a tiny teaspoon. However, with half my fl avourful $29 starter lying wasted on my platter, I felt defeated. A good rule of thumb: the more straightforward the dish, the more successful it’s likely to be. On a second visit, I ordered another of TNP’s signature dishes, a Nautilus soup kettle. Step one: choose your seafood. Step two: choose your stock. Opting for mussels, clams, reef fi sh, crab and pipis in a spicy Thai coconut stock, I expected a fragrant, rich dish. I wasn’t wrong. 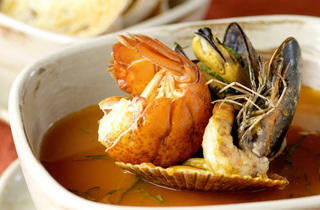 However, the meal came served in a bowl on an unnecessarily large tray, with the crabs and mussels still in their shell. I don’t mind the crack-it-open-yourself style of dining, but the setting was all wrong. Firstly, where was I meant to be discarding my shells? Waiter! Where was my soup spoon? Waiter! Where were my fi nger bowl and extra napkins? You catch my drift. By the end of the meal, I was thankful not to be on a fi rst date – things got messy. Testing the quality of seafood is always better without much fanfare. As long as it’s fresh, there’s not much that needs to be done. A little lemon here and a pinch of salt there should provide all of the seasoning needed. Save for the lusciously giant oysters – served fresh in their shells and ready to be slurped up upon arrival – TNP has decided that the more tricked-up the meal the better, creative twists and wacky plating taking precedence over practicality.